Many gamers (myself included) have been greatly enjoying The Legend of Zelda: Skyward Sword over the past couple of weeks, pleased with all the new and refreshing gameplay elements it brought to the Zelda franchise. However, in the newest issue of Nintendo Power, Eiji Aonuma revealed that Skyward Sword was only the beginning – Zelda Wii U is destined to “once again challenge the conventions of Zelda”. Skyward Sword is a title where we took aim at all the conventions of the Zelda series. While that may have been difficult, I think that confronting those challenges resulted in something that has a great deal of value. When it comes to Wii U, we’ll obviously want to add new elements that take advantage of the capabilities of the platform. I think using that as a lens through which we once again challenge the conventions of Zelda is more important than just making another Zelda game. 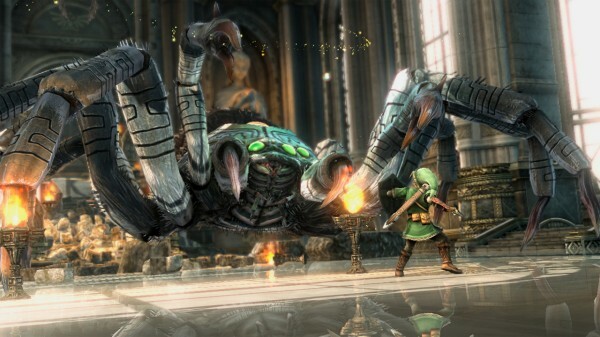 With that in mind, please expect big things from the Zelda series to come! Nintendo have already outdone themselves to make Skyward Sword the ultimate Wii game; but if Aonuma’s just warming up, I can’t wait to see what else his team will create now that they have a powerful next-generation console to work with. Imagine if Infinity Ward/Treyarch/whoever else makes cod was willing to shake things up with it like Nintendo did with Zelda. Maybe I would’ve picked up MW3 that way. You do realize that every single Zelda game (other than Skyward Sword itself) is a sequel to Skyward Sword, right? I assume a sequel is what you meant by “a continues game to it”. Facts. To me, Skyward Sword was not the best Zelda game! There wan’t too much to explore and the temples were really short and easy. I’m not a fan of motion gaming but I’m not saying the game is bad. SS it a fantastic game but not the best and I don’t hope they keep the SS formula for the rest of their games. I liked how Ocarina of Time and Twilight Princess were. Big fields and a lot to explore with beautiful temples.